PP Island, the most popular Island of Andaman Sea, is separated to be 3 Parts of Beautiful places on the Island; PP Ley, PP Don and PP North. PP Ley is the location of Maya Bay, Pi-Leh Cove, Monkey Beaches and Viking Cave. There is no hotel on PP Ley, we can say that no people residence on this place, the tourist visit here just for seeing the beautiful scenic of the nature. And yes, good for snorkeling. PP Don is the main town of PP Island. 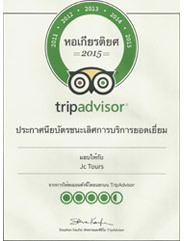 Many hotels, resorts, guest house, bars, restaurant and shops on this mainland. The tourists come here for lunch as the day trip or overnight. 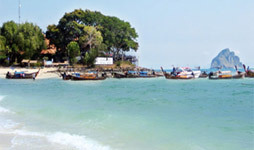 PP North: It is the north area of PP Island, the local people called Lam-Tong or Tong Cape. There are the beaches on the both side of the Cape. There are a few hotels on this area and far from PP Main Town. Lam-Tong is considered to be the most beautiful area of PP Island (Virgin Beach, Not crowded, Quiet Nature place and full of Marine Life. Jc. Tour Phuket is going to take you to meet the most beautiful point of PP Island or Koh Phi Phi by this Package "2 Days 1 Night" PP North Island. 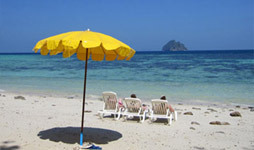 Lam-Tong Beach on PP Island has been considered to be "The Private Beach" of the tourist who had reached it. 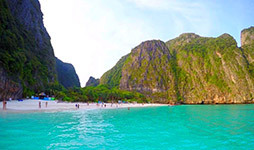 And this package, you will never miss the Beach Film point of PP Island "Maya Bay" Super Star of Hollywood, Leonardo Dicaprio, played this film. 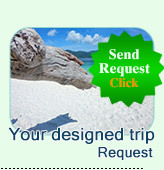 Loh-Samah Bay, Viking Cave or Pile Cove which is a great highlight point of this Package. The hotel of PP Hotel is the one you can choose to stay for this package. 08:30 Departure form Phuket to Phi Phi Island by Air-conditioned Express Boat. 10:30 Arrival at Phi Phi Don Island. 10:45 Heading for the best snorkeling site of the area. Enjoy swimming and snorkeling. 12:00 Return to the beach, relax at leisure. 13:00 Buffet lunch at island's restaurant. After Lunch, transfer to the hotel and check in. Rest of the day, free time at leisure. 07:00/ 13:00 Check out and ready at the pier. 09:00/ 14:30 Return to Phuket (Dep. from Tonsai pier). 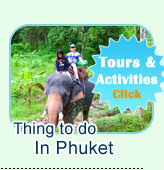 11:00/ 16:15 Arrival at Phuket pier and transfer back to your hotel. 1 night room twin sharing with breakfast . Remark : Program may be changed depending on sea & weather condition. Minimum 2 people booking. Tour Not Includes: National Park fee, pay yourself with the park staff at the island.